A rock solid SaaS operation, with a creative team of developers and designers dedicated to producing amazing web apps. SparkLIT is looking for an exceptional intermediate to senior level front end web developer. HTML, you got it. CSS, you can SASS or LESS with ease (though we all know SASS is better, right?). Cross browser quirks, you love them. Server side code to make processes flow, no sweat. Being a small team we look for people with a lot to contribute, you won’t be sitting in a corner doing the same thing every day. You will need strong analytical, design, and troubleshooting skills as well as the ability to collaborate and take ownership of projects. We value independent thinkers, creativity, and people who can self-manage. With our rapid development cycle, you’ll continuously push code and see it working for millions of people. We openly encourage new ideas and concepts that will help increase our knowledge depth and allow the company to grow and expand. who enjoys working in a high-energy, slightly unstructured environment on small teams to design and build amazing products used by millions of people. Working with our designer to make an amazing front end to our powerful backend. Understanding of and ability to use asynchronous requests/AJAX/etc. This posting is for a position working in our office in Victoria, BC. SparkLIT is a rock solid SaaS operation with a creative team of developers, designers, and support staff dedicated to producing and supporting a suite of amazing web apps. We embrace a healthy work-life balance and random ping-pong challenges, but our passion is building seriously awesome software that our customers love. This position requires knowledge of server-side programming, software engineering principles, and client-side design. Being a small team we look for people with a lot to contribute – you won’t be sitting in a corner doing the same thing everyday. You will need strong analytical, design, and troubleshooting skills as well as the ability to collaborate and take ownership of projects. We value independent thinkers, creativity and people who can self manage. With our rapid development cycle you’ll continuously push code and see it working for millions of people. We openly encourage new ideas and concepts that will help increase our knowledge depth and allow the company to grow and expand. who enjoys working in a high-energy, unstructured environment on small teams to design and build amazing products used by millions of people. For over 17 years SparkLit has been creating SaaS web apps used by millions of people. Join our creative team of talented developers and designers. Our offices, located in the heart of the downtown core, overlook the inner harbour and are surrounded by hundreds of restaurants, cafes, shops, and city entertainment. What draws people to SparkLit? Our team culture sincerely encourages a balance between life and work. We love taking breaks by challenging each other to games of ping pong (and on numerous occasions, we've taken those games down to Peacocks at the end of the day). Morning workouts at GoodLife or lunchtime games of Stratego help to solidify team spirit! Join us for a meal when we hit the town for lunches every other Thursday, and enjoy some delicious, hot and fresh pizza from Famous Original on the alternating Wednesdays. Take in the gorgeous view of the inner harbour while you munch! We offer a generous benefits package, as well as unlimited paid vacation. When you’re at your best in and out of the office, we all thrive together. No better place to live and work. At SparkLIT we strive to provide a positive team culture that balances life and frequently challenging work as we push ourselves to delight our users. 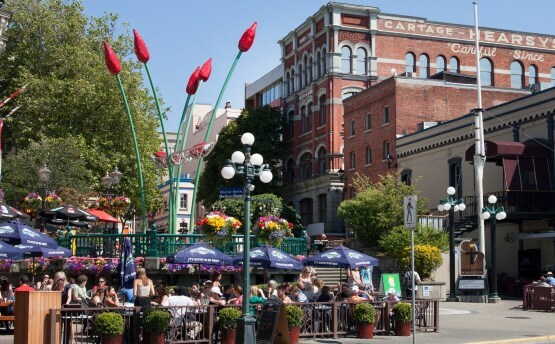 We live and work in beautiful downtown Victoria, on the west coast of British Columbia, Canada. Our offices, located in the heart of the downtown core, overlook the inner harbour and are surrounded by hundreds of restaurants, pubs, eateries and city entertainment.